my shifter but the neutral safety is still tied to the column. I installed the sending units for my future rally gauge swap and mounted my summit oil/water gauges with two sided tape to the bottom of the ashtray. So I got the new steering gearbox installed. I used the one from Napa for a Hurst olds. I replace the two lower bolts with new grade 8 from local hardware store. I flushed the pump and primed the gearbox and on my test fire I had working power steering. 2 1/2 turns lock to lock. I replaced my seized throttle cable and took it for it maiden voyage about a block down the road and back. I still don't have my vacuum modulator or kickdown hooked up but just moving under it's own power ,open headers, no hood was a awesome point for the day. I'll see your Vibe and raise. Good day for the Cutlass. Congrats! Did Napa accept your old box as a core? I'm gonna be replacing mine soon. 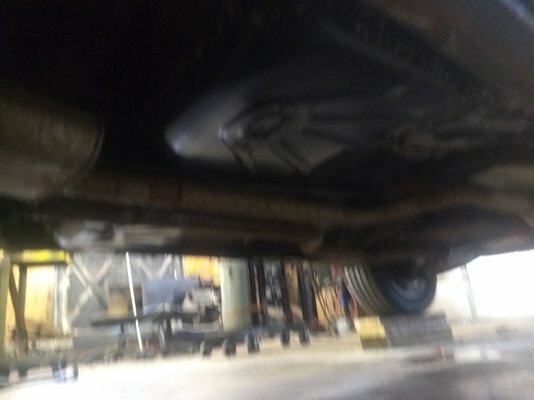 So this weekend I hooked up the vacuum modulator, kickdown cable and made my dual exhaust out of part new parts(walker exhaust Monte Carlo tailpipes) and my original intermediate pipes and mufflers that I had new on it 18 years ago. The pipes and mufflers look bad from setting under the car all these years but we're like new on the inside. I had to get hangers and some adapters since my mufflers we're bigger than the tailpipes. 2 1/2 down to 2 1/4.